Find below some of the World’s Best Landing Page Builders. WHY USING A LANDING PAGE BUILDER? Landing pages are a key part of any digital marketing strategy. You can’t just put out a blog post every week and hope to capture new business. Landing pages are one of the best options when it comes to effectively collecting email addresses vital for lead generation and email marketing. Because landing pages are used towards the bottom of the sales funnel (once prospects are visiting your site), just a small change in conversion rate can have a huge impact on your profit over time. Does the landing page builder allow you to visually represent your brand perfectly with the flexibility to tailor your landing page exactly how you’d like? Can you create your landing page fast and without a web developer using professionally designed templates and an intuitive canvas? Can you capture visitors’ information and make sales via forms that integrate with your CRM other business systems? What can landing pages help you accomplish as a Digital Marketer? Highly convertible landing pages can turn prospects from any traffic source into leads and customers for your business. Depending on your business goals, you could use custom landing pages to build an email list, make sales, register people for your webinars, launch your next product, and more. Custom made landing pages in general have a higher conversion rate than any other blog post or generic page, the conversion rate on landing pages can differ drastically. According to Hubspot research, the typical landing page converts at 5 to 15%, but some landing pages that are highly optimized convert at 30% or above. All three of these problems can be solved with any number of landing page builder tools such as Thrive content builder, Optimize Press or Visual Editor. 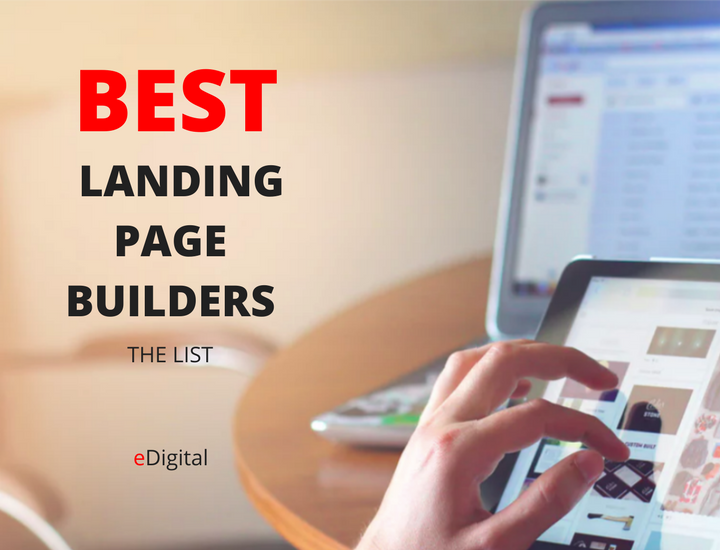 The best landing page tools help you get up and running fast so you can get to the next step, A/B testing. CAN LANDING PAGE BUILDERS PROCESS PAYMENTS AND DELIVERY MY DIGITAL PRODUCTS? Yes they can. Their Paypal or Stripe powered checkouts makes it incredibly easy to sell products and services right from your landing pages and popups. With your favorite integrations and our built-in asset delivery system, you can even – for example – fulfill digital orders and sign people up for paid webinars. WHEN IS THE RIGHT TIME TO BUILD AND PUBLISH A HIGHLY OPTIMAL LANDING PAGE? You’ll get the most out of landing pages once you have something to promote (or pre-sell) and some ideas for promoting it. If you’re not quite there yet, consider subscribing to some of the below providers blogs and e-newsletters — They are packed with resources that will help you grow your business and lay out your digital marketing strategy and lead generation with confidence. WOULD I NEED ANY OTHER TOOLS OR SOFTWARE APART FROM A LANDING PAGE BUILDER? You can build and publish a highly convertible landing page to collect leads and deliver digital resources without any other software. However, in the long term, you will probably want an email service provider to store and follow up with your new leads your landing page has generated. If you are using the Checkout feature of some of the below Landing Page builders, you will likely need a Paypal or Stripe account. WOULD A NEW LANDING PAGE REPLACE MY WEBSITE? It depends. Some marketers use a landing page builder to create all the web pages their business needs, including their home page. However, the primary purpose of a landing page builder is to let you easily build effective landing pages—that is, pages designed to get visitors to take one very specific action, such as subscribing to your email list, signing up for a webinar, or purchasing a certain product. These pages can complement your existing website. ARE LANDING PAGE TEMPLATES REALLY FREE? Almost all landing page builders comes with unlimited access to hundreds of landing page templates. You may also have the opportunity to expand your account with paid add-ons. CAN THE LANDING PAGE URL BE WITHIN MY WEBSITE URL? Yes. In fact, most landing page builder tools allows you to publish pages to unlimited external sites urls. If you have a WordPress site, you might want to choose a landing page builder that offers a wordpress plugin, and you’ll be able to publish any landing page to your site in minutes! CAN I USE A LANDING PAGE BUILDER TO CHANGE MY WEBSITE HOME PAGE? Yes, your homepage is probably one of the most visited pages on your site. Is it making the impression you want it to make? Is it engaging visitors and boosting your conversions? With a highly convertible landing page builder, you can use one of their templates or build a beautiful, professional looking homepage or improve the layout on your existing homepage by adding things like columns, horizontal opt-in forms, a stylish gallery of your blog posts, social share icons and more. If you need more than a page builder and you are looking for a potent 360 marketing tool that includes CRM, marketing automation, e-commerce, email marketing , sms marketing and more then Ontraport is a great option to review. Below we will only highlight their landing page features which can very very powerful for generating leads and closing business. Create and launch your pages without a professional designer or developer using a simple drag-and-drop interface. Page templates and pre-designed icons, buttons and forms created to cover your essentials. Customisable settings for fonts, sizes, colours, layout and every element of your page, and mark your “favorites” for easy, fast access every time you create a page. Keep your must-have palette options at the forefront, and simply toggle on your advanced customisation when needed. Use built-in forms in your pages to their fullest potential with a multitude of capabilities to capture visitors’ information, entice them to buy, take orders. Create lightbox forms that pop up based on the visitors’ actions to garner attention, and automatically pre-fill forms to make it easier for leads to convert. Add order bumps or one-click up-sell offers to your sales pages to sell more to your customers right at the point of checkout, and increase your total revenues. Provide individualised experiences to each page visitor thanks to the seamless tie between your pages and your CRM contact database in the platform. Show each page visitor different information and offers based on who they are, where they came from, and more using dynamic content to drive conversions. Reach customers whether they’re viewing your page on a mobile device, tablet or desktop with responsive pages that adapt to any screen size, and show different content on each device for a more targeted experience. Show each visitor the right message at the right time to prompt action by setting certain content blocks to show after a designated period of time. Use built-in analytics to track important performance metrics so that you can adjust your pages for better results. Record unique page visitors to see which pages are most popular, and track conversion rates to generate more qualified leads. Split test individual elements on your web pages to gain valuable insight about what copy and design elements work for your audience. See up-to-the-minute lead source tracking data and performance stats so you can make strategic budgeting and planning decisions. Elementor is a landing page builder tool for wordpress. Elementor is a front-end drag & drop page builder for WordPress. Elementor lets you design any landing page, on any wordpress theme. It’s free and easy. Live chat if you have any questions or need support. Landen designs beautiful, responsive and performant landing pages for you. And they host them too! A handy tool that does a good job in helping entrepreneurs build landing pages that look professional without having to buy into expensive or complex to use publishing tools. Landing page templates are clean, modern, and aligned very well with conversion optimisation principles. Dynamic Text Replacement. Allows you to match your PPC ad’s keywords dynamically with your PPC ad’s landing page. It works with AdWord’s dynamic keyword insertion (DKI) or you can use it for email marketing campaigns. Use DTR to save time and money on your PPC campaigns. Lander’s landing pages are straightforward and easy to build. It offers A/B testing at every price point. Test up to three different versions of your landing page. Test your copy, images, calls-to-action, colors and more. You can even make changes in real time to get real time results. Their landing pages can be easily integrated with Paypal, social media, Mailchimp, Salesforce, and others. Facebook landing page tab. How many of you have been wanting to add your Landing Page on Facebook? Well with Lander, you’ll now be able to create your own Facebook tabs in minutes, without the help of any other app or coding knowledge. Just 4 simple steps, that’s it! You’ll have your Facebook Tab integrated and published live, ready to go viral! All these unlimited: landing pages, domains, visitors, leads, users. Live chat, email support available. The 49/month plan includes: zapier and marketing automation integrations. LeadPages doesn’t stop at the page itself. With high-value features like opt-in boxes and click-to-subscribe text links, a LeadPage subscription provides owners with a formidable set of tools to build email lists or convert traffic into buyers. LeadPage price points have NO usage restraints. The starting price of $37 per month offers landing page templates and opt-in boxes with no additional features. The next tier at $67 per month offers the full slate of features, including access to affiliate networks and custom template uploads. WordPress Plugin to create and publish landing pages in minutes! Easier to contact them via their Facebook page. Are your Facebook pixels working? Test your landing pages with Monitory. Get a snapshot of your page on different popular desktop, mobile and tablet devices to know your campaign is always looking sharp. Monitory automatically detects forms on your page, fills them as a user and makes sure the lead reaches your CRM. Monitory tests all your conversion and tracking pixel are installed correctly, even after the form is submitted. Create high converting landing pages, Sales and Marketing pages, Free Training and Course pages, Webinar registration pages, Secure Membership Portals. Fully Responsive “Mobile Ready” Pages Instantly. OptimizePress automatically generates fully responsive pages for you when you with no extra work. So now your landing pages, sales pages and membership sites can all look stunning on any device. Authority Blogs. Grow your audience with our premium blogging system. Over 40 Custom Elements. Each element with a different style and options so you can add almost unlimited functionality to your page. Choose from elements such as Headlines, Order boxes, Testimonial Blocks, Progress Bars, Countdown Timers, Video & Audio Players. Email Support and live chat. Landing pages: Create a fully-customizable landing page and start building your product’s audience in just a few minutes. Every email collected is yours to keep. Broadcast product updates and solicit feedback with our powerful email builder. Email marketing: Every Message generates a discussion link, where users can ask questions interact with each other. Embeddable widget: Capture interest on your own website, blog, or web app. Installation is as easy as copy paste. Email form: Do you already have a landing page? No problem! Embed a pre-built email form in seconds – any new subscribers will be added to your database on Product Hunt automatically. Drag and drop editing. If you want to change something, you click on it and you’ll see your edits instantly. If you want to move something, you click, drag and drop. Easy! 80 Landing page templates to choose from. 80 beautifully designed and 100% conversion focused landing page templates. It’s simply the fastest way to create professional looking sales pages, opt-in pages, webinar pages and more, that are instantly publishable yet still completely customisable. Pre-build conversion elements. Replace a dozen plugins thanks to their conversion focused elements. Includes infinitely customizable buttons, testimonials, countdown timers and lead generation forms that integrate with your favorite email marketing tools. Instantly preview your landing page on different screen sizes. As you build your page, you can easily check what it looks like on different screen sizes instantly! Define unique content for specific screen sizes. For any element (or any container with multiple elements in it), you can define which screen sizes it should be shown or hidden on. That way, you can create the perfect layout for every screen size. Pro sales pages. Sales pages are the bane of WordPress users. If you’ve ever tried to build a sales page using the WordPress editor, you know for sure that it wasn’t made to build the kind of layout you need on a sales page. And never mind the layout, what about the copy? Fear no more, Thrive comes with everything you need to build stunning sales pages. And what’s more, we’ve even included tutorialized sales page templates that make copywriting fill-in-the-blanks easy. StartUp idea validation landing pages. Many successful startup began with a simple landing page to get leads and validate a business idea. That’s exactly the kind of page you can create with Thrive Architect, in record time! Evolve your WordPress blog posts. Blogging is evolving and if you want to keep up, you can no longer just write a wall of text and post it. Clever content marketers have long known that well formatted content, including things like highlight boxes, styled lists, images and other media, click-to-tweet quotes and more, get much higher engagement. That’s why Thrive has included all of those elements in their Thrive Architect toolbox. Webinar or product launch pages. You can easily build all the pages you need to announce, get leads for and expire a live webinar event. With Thrive you can create a professional looking product launch sequence to help get your next business off the ground. Unlimited A/B testing. Setting up A/B tests in Unbounce is dead simple. With just a few clicks, you can split traffic between two versions of the same landing page to see which performs better. Drag and Drop Builder. Easily build custom landing pages and overlays — no coding required. SSL encryption. Unbounce protects your landing page data by automatically creating an encrypted link between server and browser. All landing pages display a green security padlock and HTTPS address, ensuring visitors your data comes from a secure source. All these integration included on the cheapest package: WordPress, Mailchimp, Google Analytics, Hubspot, Infusionsoft. Next package at USD$159/month includes integration with Marketo and salesforce. The free Unbounce Landing Page Analyzer. used data collected from 74,551,421 visitors to 64,284 lead generation landing pages created in the Unbounce landing page platform. This serves as a benchmark to analyze your lead gen landing page and make customized recommendations to improve your page performance. grades your landing pages and tells you how to improve them by giving you an in-depth, personalized report card. gives you downloadable and compressed versions of your page’s images, to increase your landing page load speed. Great selection of Landing page templates. Hellobar provides A/B testing services. Since only the most comprehensive messages are being read, you will be able to convert more visitors into customers through Hellobar. Targeting is one cool feature. You get to decide which users see a particular bar. This works particularly well for visitors who continuously visit your website. It makes things more interactive so the user experience enhances greatly. You can set single or multiple conditions for targeting depending on your requirement. You can precisely target devices and users which gives the users an impression that they are being contacted. Hence, they are more likely to convert. Heatmaps. See where they scroll & click. When you know where your visitors are looking and clicking, you’ll be able to know exactly where to put your most compelling content & your best call to action. Screen Recordings. See your website through the eyes of your visitor. Someone just left your website without converting. Do you know why? Now you can watch recordings of individual browsing journeys to see where they’re click and discover why you’re losing them. Funnel Analytics. See where your visitors are dropping out of your new landing page. How do you know which part of your landing page you should optimize if you don’t know where users are dropping off? Form Field Optimisation. Get more leads and sales with form interaction data. Should you ask for first name AND last name? And what about about phone number? With form field reports, you don’t have to wonder. See which fields are getting filled, and which ones are causing your visitors to bounce from your landing page. Micro Surveys. Create simple onsite questions on your landing pages that deliver immediate answers. Long surveys are great, but sometimes you just need quick feedback on a quick question. You can post a simple poll in seconds on any landing page and following virtually any user action. Surveys. Know What Your Customers Are Thinking about your landing page content. From measuring customer satisfaction to getting alerts about unhappy customers, TruConversion’s surveys would help you discover the hidden needs and expectations of your customers. You can create optimal forms and high response rates. Get videos of real people speaking their thoughts as they use your website or mobile app. Go beyond analytics and understand why users do what they do. If you are running a webinar, one of the best tools to promote it and create all the necessary landing pages is Webinarjam. 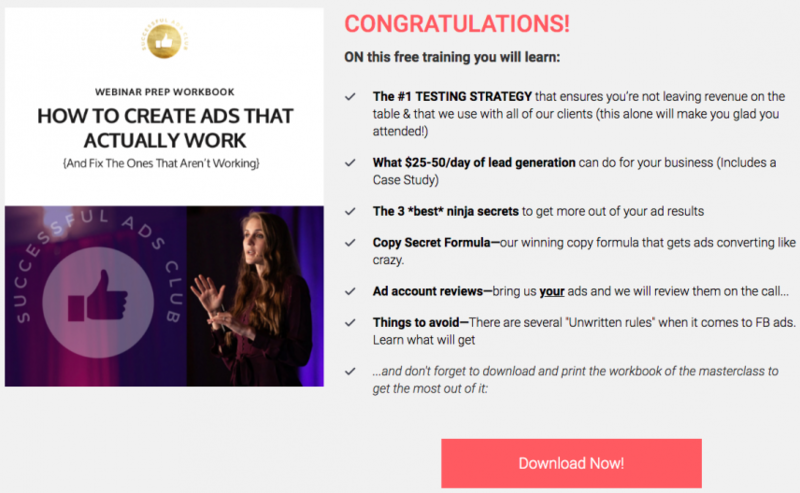 Below is an example of a landing page of a webinar run by Successful Ads Club. OptimiSe the clarity of your designs by measuring first impressions. Five second tests can be used to test landing page designs, logos, brochures and marketing material. Wherever first impressions count, use a five second test.